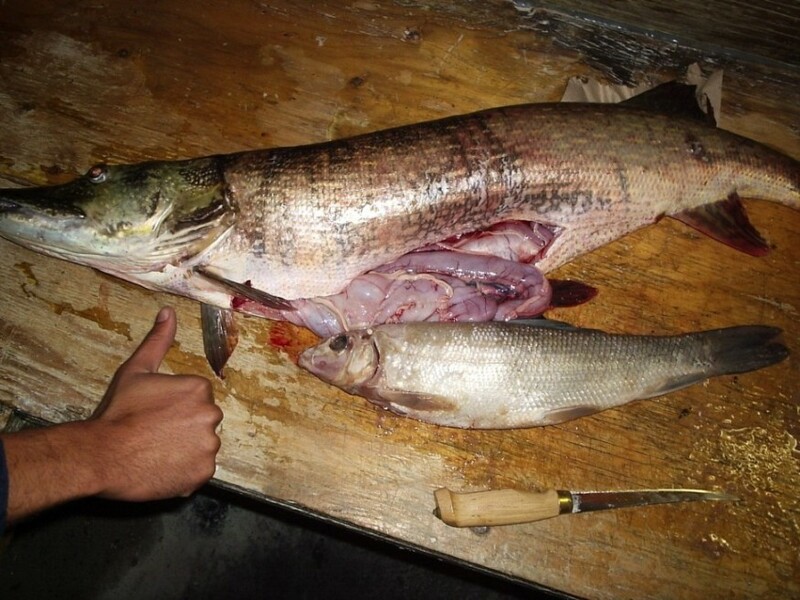 I was inspired by the thread about the pike with crayfish in its stomach to post a couple pictures from a few years ago. While I was in school I used to work as a fishing guide on the Albany during my summers. There was a small First Nation community 20km down river and some members would come up to occasionally net sturgeon, which they would bring back to their community to eat. I would used to help them empty their nets and clean their fish. A large pike was once caught in one of these nets, where it unfortunately died. 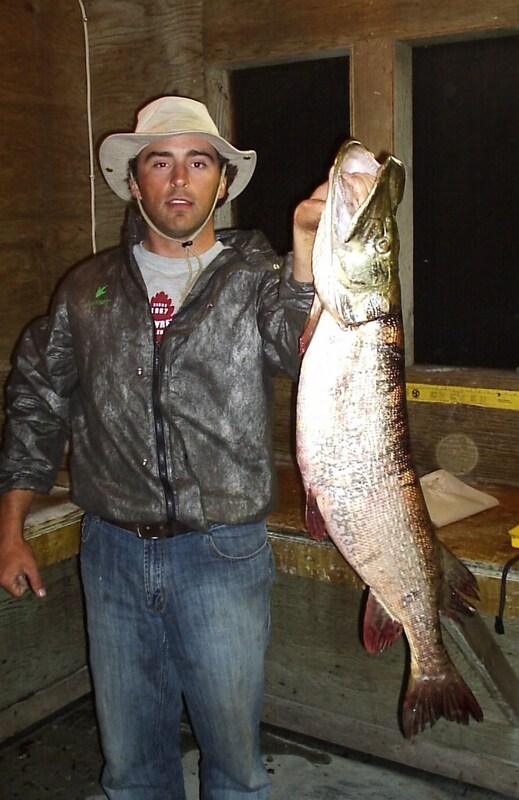 It was the only pike I ever saw get caught in a sturgeon net. Anyways, here is a picture of the fish, as well as what was in its stomach (the fillet knife is there for size reference). As a side note, the fish was eaten. As a second side note, please don`t hijack this thread and turn it into a 'should they be allowed to net fish' debate. I'm just sharing a cool pic...that's all! Enjoy! I don't see the pic with it's insides. wow that was a hungry pike! Nice little meal there, no wonder she looked so fat in the first pic. I use to have a pic where a guy cleaned a huge pike and found a little Loon in it, can't seem to find it. The pike for supper and the sucker for desert. Is that a sucker or a whitefish? My first guess was whitefish but I could very well be wrong. Cool pic, thanks for sharing.. Eating sturgeon?? no hijack but did not know you could eat these.. Did you try it ? Sure that was done for centuries just courious about eating it. we openned up a smallie a few weeks back and it had 9 crayfish in its belly! The thing only weighed 2 1/2 or 3 lbs! And she was still feeding because she nailed the lure! Here are couple of videos i found on youtube of pike eating another pike and just attacking a lot of different baits. Never heard of eating or netting sturgeon in my lifetime. Should of never mentioned the Sturgeon. Now Im curious. As far as the Pike, witnessed my Buddy catching a 26lb Pike below the Lachine Rapids in Mtl. When he cleaned it , it had a 3lb Brown trout. Imagine the St lawrence River. Sturgeon is quite tasty and very non-fishy. Whenever I get the chance, I attend local powwows where they frequently serve up wild game buffets that often include sturgeon. In those cases, a piece of sturgeon is the first thing on my plate. 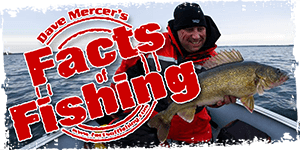 Commercial fishermen count themselves lucky to catch a big hen sturgeon, even though they can damage nets. The eggs are worth their weight in gold. Sturgeon netting goes on right outside my door on the river here all summer long. I have yet to bother trying it. The idea of it bothers me. To each their own I guess. That is one fatty pike off the Albany for sure, looks like a whitey in the belly with that pointy snout. Looking forward to one day trying that river, wherabouts were you guiding? Just curious...what time of year was this fish netted? I was guiding out of Miminiska Lake, part of the Albany system. Amazing spot! Agreed. Sturgeon is actually great tasting fish. Very firm, light tasting meat. I had smoked sturgeon at a Jewish diner and loved it. I highly recommend it if you come across it on the menu or keep one and want to try your hand at smoking.